SEOUL, Aug. 14 (Yonhap) — South Korean director Kim Dae-hwan has received the rookie director award for “The First Lap” at the 70th Locaro Festival that closed on Saturday. Kim became the fifth Korean director to win a key award at the film festival and the first to clinch the top award for first and second-time directors. Starring Kim Sae-byuk and Cho Hyun-chul, the film revolves around Su-hyeon, an art instructor, and Ji-young, a contract worker at a small company, who have been living together for six years. Su-hyeon heads for Samcheok on the east coast to introduce his long-time girlfriend to his estranged working-class parents at his father’s 60th birthday after Ji-young reveals her period is late. 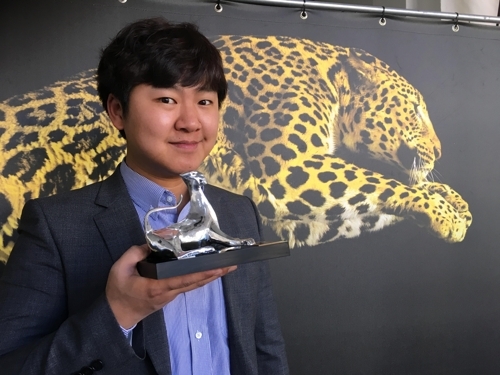 The Locarno fest has awarded South Korean films since 1989, when director Bae Yong-kyun’s “Why Has Bodhi-Dharma Left For The East” won the top honor, the Golden Leopard. In 2016, South Korean film “Right Now, Wrong Then” earned director Hong Sang-soo a Golden Leopard and lead actor Jung Jae-young the best actor’s award. This year’s film festival ran from Aug. 2 through 12 in the Swiss city of Locarno. “The First Lap” premiered at this year’s Jeonju International Film Festival in May as one of the titles chosen for its signature Jeonju Cinema Project program. The film is scheduled to open in local theaters in the second half of the year.